Hey guys, if you are looking for some AWESOME ways to organize your kitchen, you are going love this list below!! 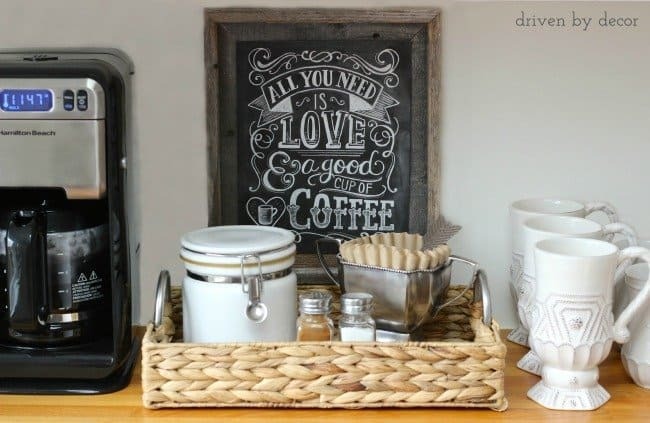 These genius ideas, tips, and DIY projects will organize every nook and cranny of your kitchen! 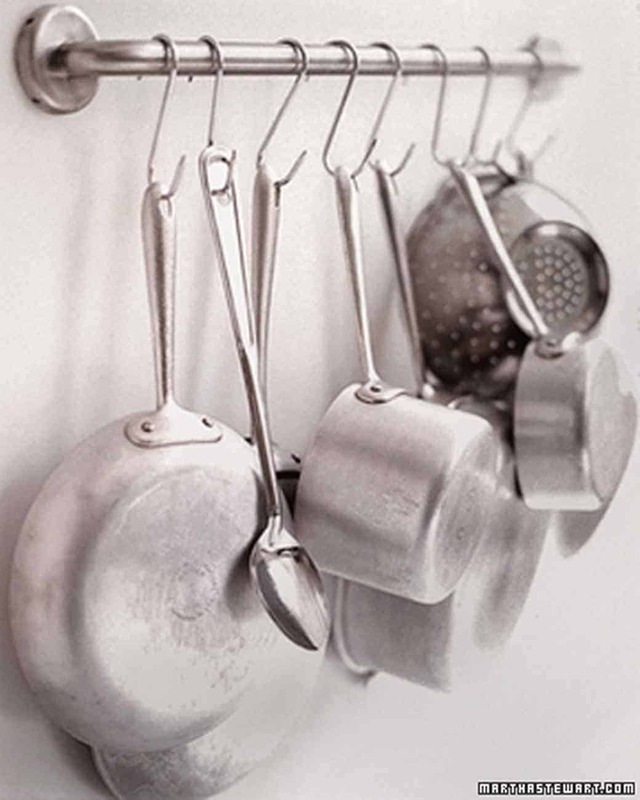 We spend so much time in our kitchens, wouldn’t it be so much nicer if we eliminated the clutter?? 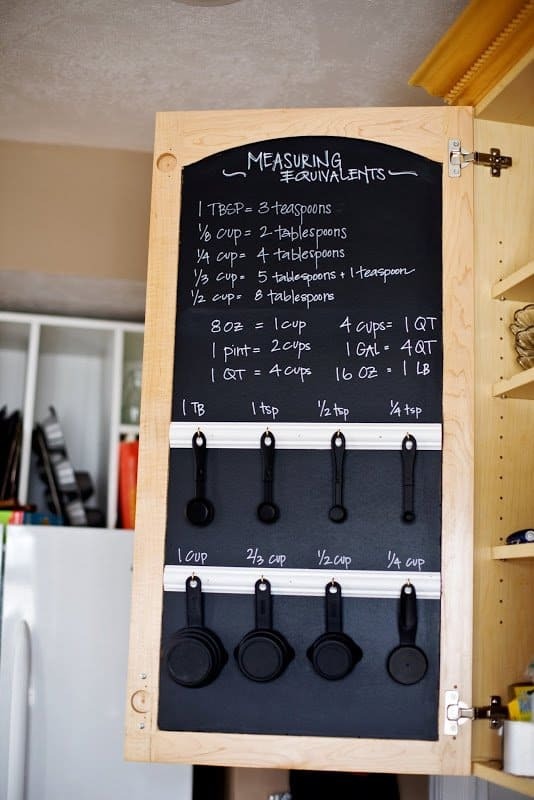 Take a look at these organization ideas below and be sure to follow my Amazing Organizing Ideas Board on Pinterest for even more AWESOME organization tips! 3. 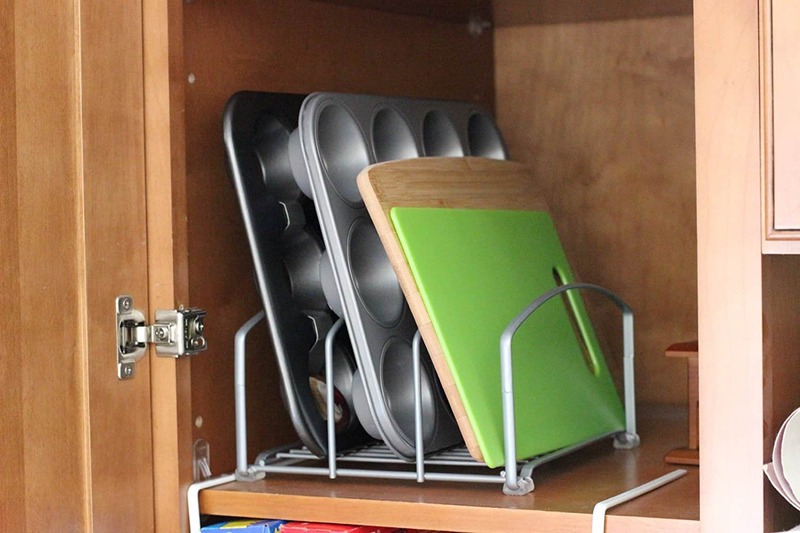 This Kitchenware Organizer will organize all your cookie sheets, muffin pans, and cutting boards perfectly. Before I got this nifty organizer, it was so annoying to grab my cookie sheet because they were all stacked on top of each other. Now I can easily grab my cookie sheet and get baking! 5. 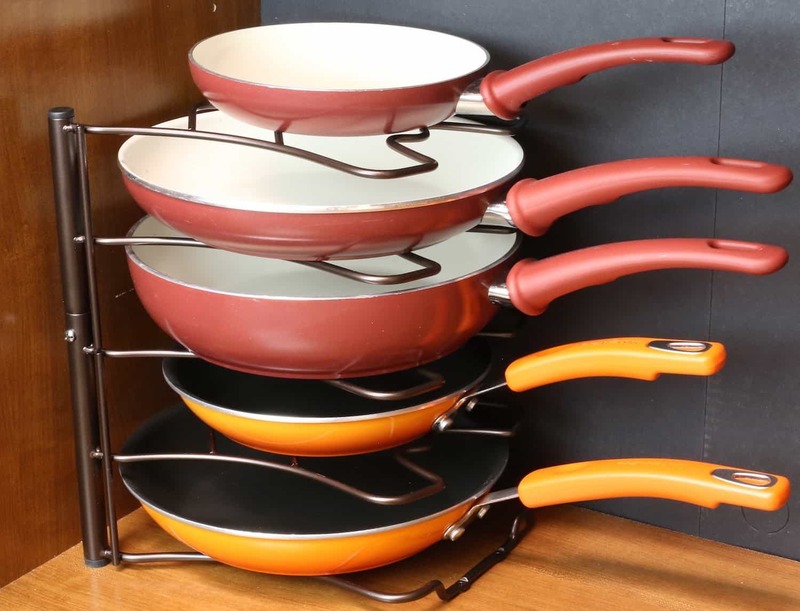 Organize your pans with this awesome Pan Organizer Rack. 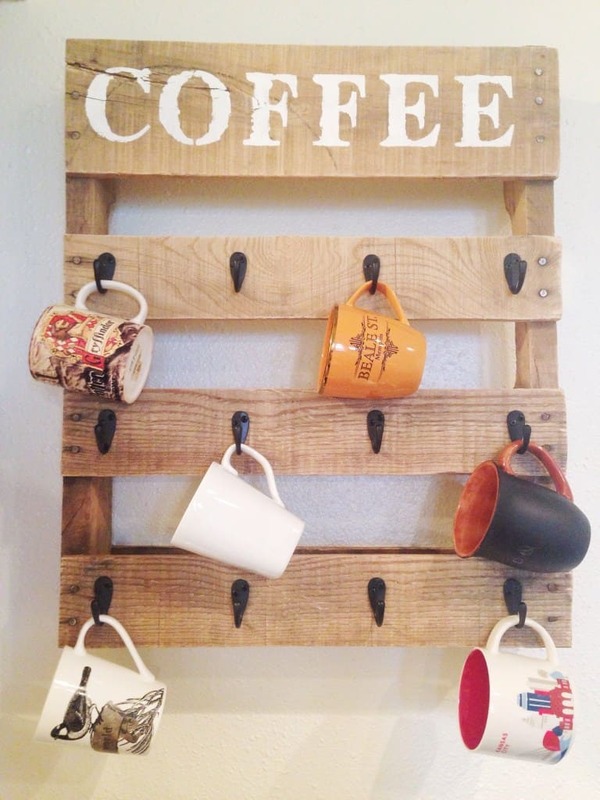 You can save so much space and use it either vertically or horizontally, whichever fits your cabinets better. 7. 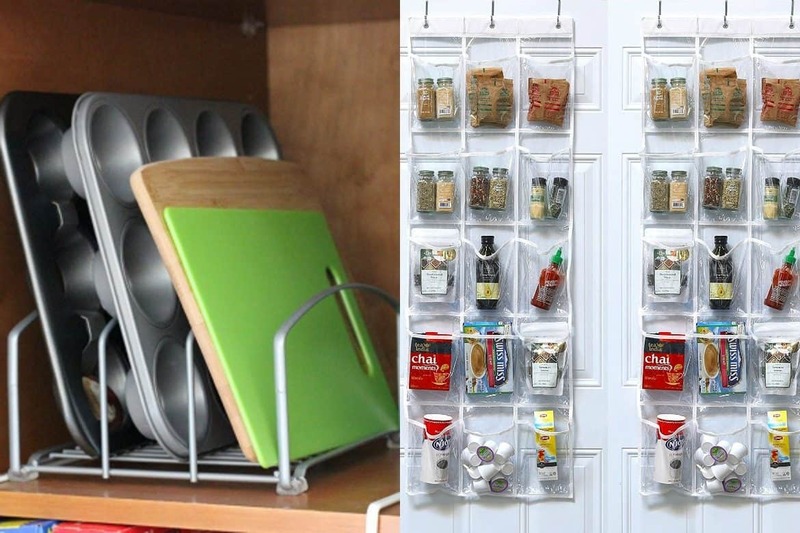 Keep all your storage wrap organized and out of the way with this cool Storage Wrap Organizer that you can affix to your cabinet. It is really easy to hang as well! 10. If you are like me you probably get sick of plastic bags laying around everywhere. 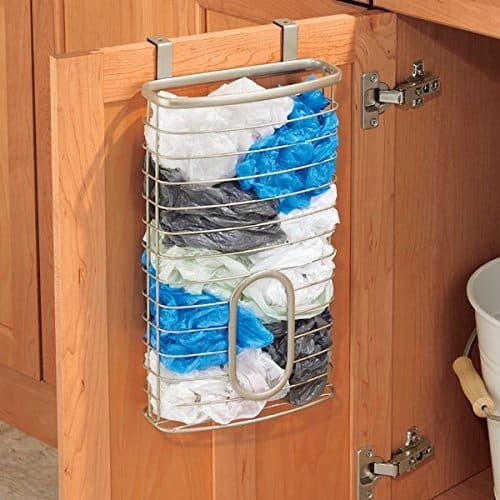 One great solution is this Plastic & Garbage Bag Holder that fits perfectly over the cabinet and can hold up to fifty bags. Impressive! 12. 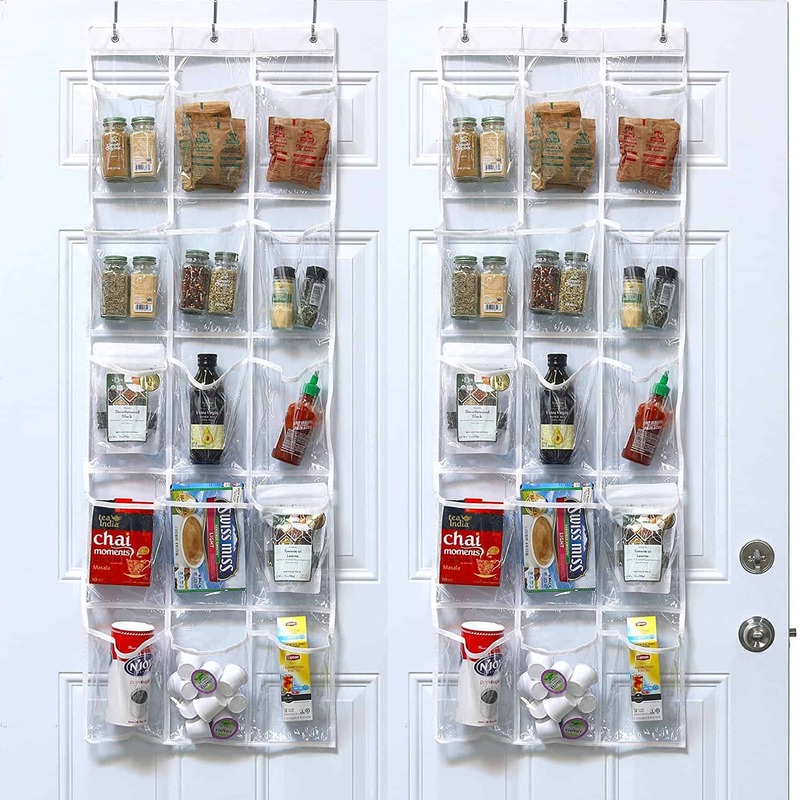 Need extra space in your pantry? 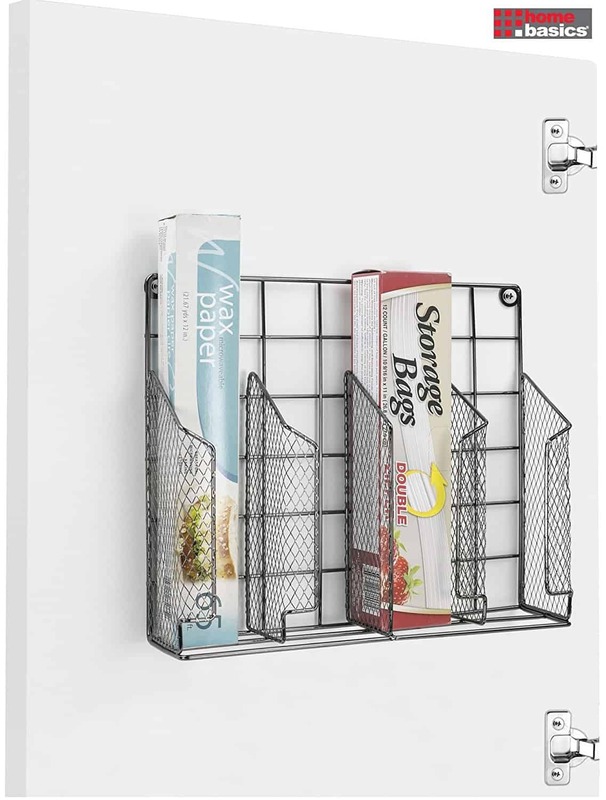 This Over the Door Hanging Organizer will free up so much room. 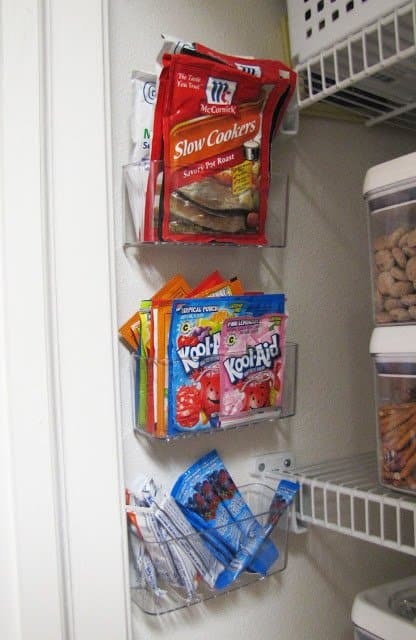 Great to store snacks to grab on the go! 15. 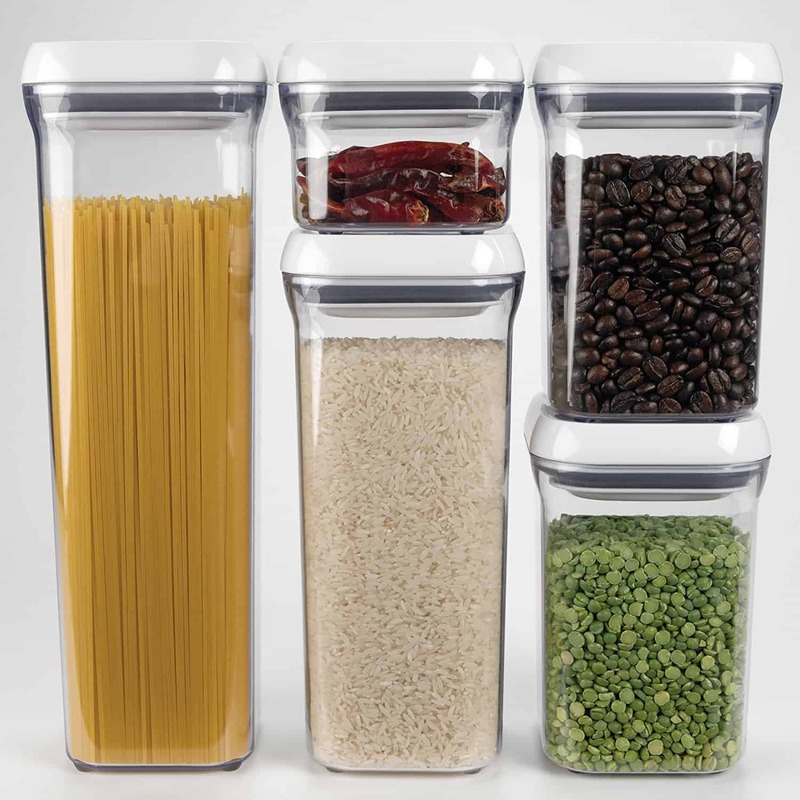 Keep all your dry goods organized in these Stackable Airtight Containers. 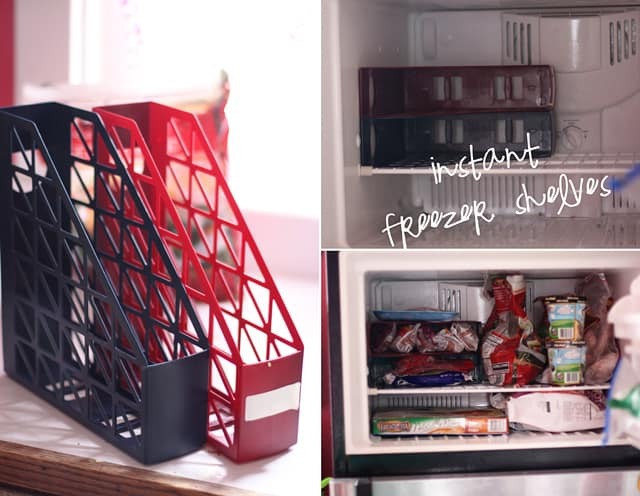 These are stackable which saves a ton of space, but more importantly, I have SAVED LOADS OF MONEY because the airtight seal keeps my food fresh longer. You can buy them in a set or individually, but if you are looking to buy mulitples, a set is going be much cheaper! 18. 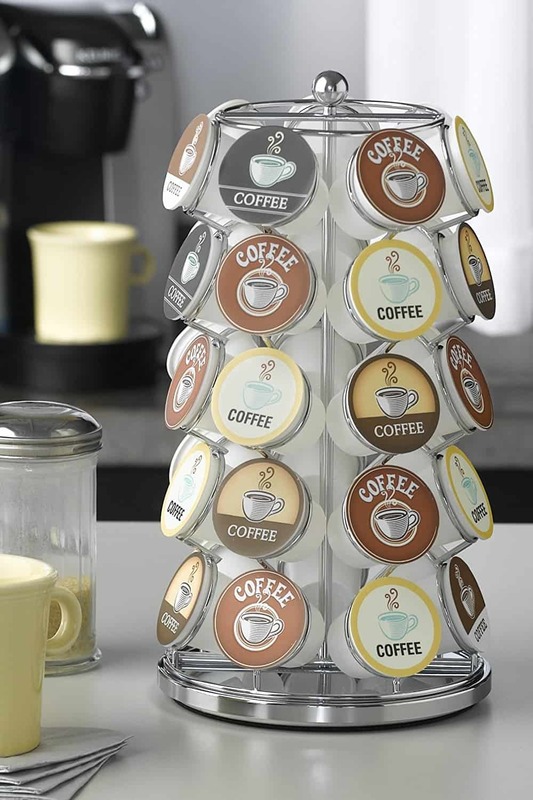 Speaking of coffee, if you need a way to house your Keurig coffee cups, this Carousel K-Cup Holder does a great job! Hope you guys found this list useful! 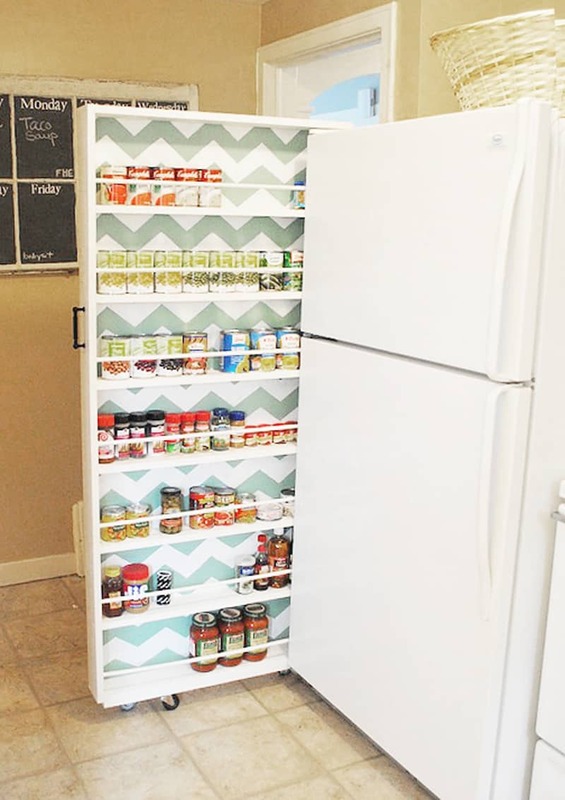 For more organization tips & hacks be sure to follow my Organization Board on Pinterest!